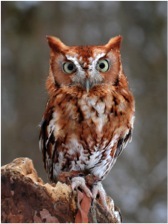 Rufous | Meet The Ambassador | RAPTOR Inc.
Rufous:, a male, red Eastern Screech Owls is often mistaken for a young Great Horned Owl. Like Great Horned Owls, they have ear tufts and golden eyes. Weighing only 1/3 of a pound, his attitude is as fierce as a great Horned Owl! Nocturnal and making its home in a cavity, you might be unaware that the owl is living in the woods behind your home till you hear it’s vocalization which sounds like a horse whinny.